You know the feeling when you eavesdrop and hear someone singing your praises? Even if it's just something little like "Her hair looks so cute today!" Doesn't that just make your day? Well...it's similar in the blog world. You occasionally run across someone talking about you or your product. And that's always truly truly exciting. Especially when you're new to the world of selling your stuff online. 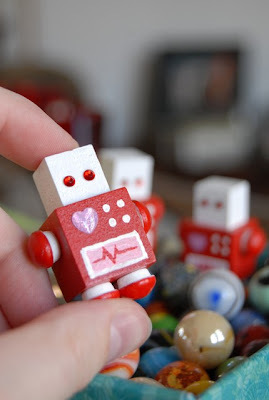 I was notified this morning that my Baby Robots were featured in Jenny N. Design's blog!! SO exciting. Read it HERE. Visit my Etsy shop HERE to see the robots themselves. Baby Robot for Valentine's Day! Visit my Etsy shop HERE to see them and adopt one of your own. Just in time for Valentine's Day! Or just for someone who really likes red, white, and pink! MORE are on their way so keep checking back, folks. Did I just say folks?